While we find the "Gen I" basically balanced, some find our "balanced" slightly thin and bright relative to the more lush "colored" capacitors which would include the "Gen II". While the Gen II has a nice midrange bloom, Gen I has a slight advantage in the frequency extremes (top and bottom). In some applications, larger values of Gen I bypassed with smaller values of Gen II yield a favorable result. Dissipation Factor is typically better than 0.02% @ 1kHz. 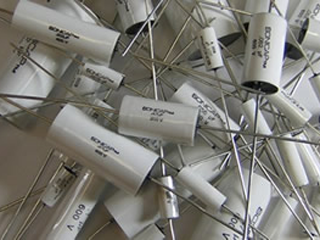 The Sonicap leads are tinned solid copper (high purity). The shorter lead is shield. Tolerance is better than 5%.